If you’re looking for one of the best used midsize sedans in the Johnston and Providence area, the Nissan Altima might be for you. Each generation of Nissan Altima brings new advantages and features that will serve you and your family well. Get your used Nissan Altima today from Shannon Motors. The first generation Altima immediately became one of the most popular and influential mid-size sedans on the market, with sporty and satisfying handling that rivaled many other sedans. The engine was a standard Nissan 4-cylinder machine that produced 150 hp, with a suspension that included two stabilizer bars for a comfortable and spirited ride. It had plenty of standard and optional accessories that were advanced for the time, such as a digital heads-up display built into the windshield, automatic digital climate control, and even keyless entry with an optional alarm. 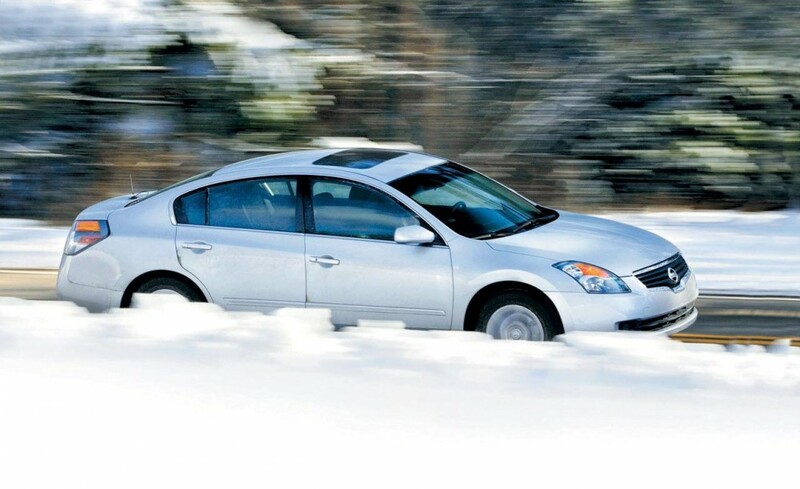 The second generation of the Altima featured a stronger engine, which produced 155 hp, as well as a more responsive ride with a redesigned suspension. There was more emphasis on craftsmanship as well, with a more solid and higher quality feel and a roomier, more comfortable cabin with standard leather seats. The Altima also added features like a rear spoiler, a power driver’s seat, and standard side airbags on more trim levels. The third generation of Altima was built on the new Nissan FF-L platform, which was a major success for Nissan and made the Altima into a household name. This new Altima added a stronger 3.5L V6 engine option that produced an impressive 250 hp, or up to 260 hp with the new SE-R sports model. The Altima also included better handling and more aggressive styling with a roomier cabin of almost 119 cubic feet, leading to a new branding strategy of “The Cure for the Common Sedan”. The new Altima was named the North American Car of the Year in 2002, as well as the 2002 Best of the Year car by PBS’s MotorWeek program. The new Altima also got new features like a DVD-based navigation system, as well as a sport suspension and a high-flow exhaust system for better handling and easier performance. Many critics praised the Altima’s brand-new style and spaciousness, acknowledging it as a segment leader rather than an alternative, and as one of the most powerful and best-handling sedans for families on the market. The fourth generation of the Nissan Altima used the smaller Nissan D platform, with an upgraded rear suspension and a newly designed front. The engines were upgraded to produce more power, with the V6 engine producing 270 hp. New features were added, including push-button start and Bluetooth capability, as well as a more intuitively designed dashboard and performance features like electronic stability control. The current Nissan Altima offers more than ever before, with an even more powerful V6 engine and a new continuously variable transmission. Finally, the new Altima’s exterior and interior are more stylish than ever, with an upscale feel. Are you ready to find the Nissan Altima that fits your lifestyle and your budget? Shannon Motors can help! Call us today at or come see us at , .